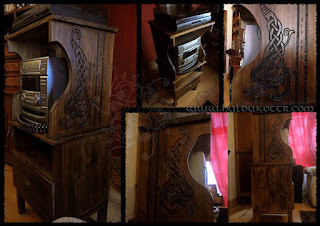 HULDUKÖTTR - Norse and Germanic Art: Self comission on wood. This is a "self comission" for our own home, made of lackered Finnish pine. We will probably add more norse ornaments over this in the future, but for now the furniture is operational . Of course, the carved pattern is an own design. We hope you like it!